Our first club tournament of the year is Saturday, May 16. We hope to see y'all there. Johnny Lazarich is providing us with his wonderfull pulled pork sandwiches. You can call in on channel 68 beginning at 5:00 A.M. The tournament boat is Grey Lion. Run time is 5:30 with lines in the water at 6:00. You must be back in the harbor by 1:00 P.M.
All boats must have their cooler in line at the salmon unlimited pavilion by 1:45 at the latest. The target fish will be determined the morning of each event and called out by the tournament boat. Hope to see everyone next Saturday. Haven't had a chance to get out on the water yet... But, looking forward to a new start (Rookie Season) in this Tournament thing. Hope to see you all again this year and can't wait to get the boat going! Don't know how much work I'll get done this week as my mind keeps drifting off on trolling the Big Lake! 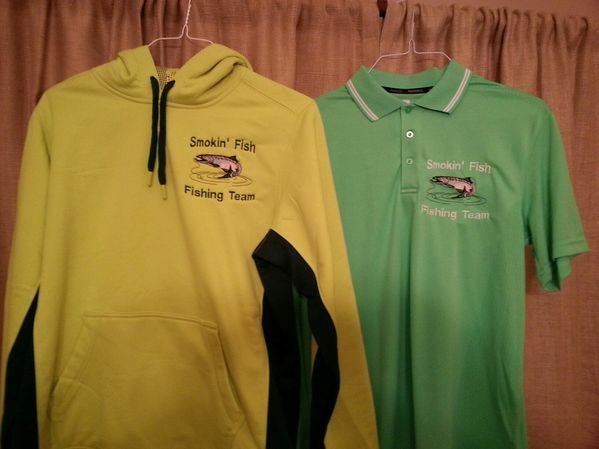 Smokin' Fish - Team Shirts and Colors. They are kind of Bright, but I like the way they turned out! If for some reason, wind velocity, small craft warning, we have to cancel the tournament, I'll make an announcement on twitter @SUIllinois as soon as I can Saturday morning. If you don't have a twitter account, log on to Salmon Unlimited's web site, and in the lower third of the home page, our SU twitter log is right there and you can see all my tweets. I will have something posted right there. Yes you can hand the waivers in at the weigh in. Cost is $30 plus $10 for the big fish tournament almost everyone gets in. Let's all just hope for good weather on Saturday! Along with getting rid of some of this rain for a while. A projected East / North East wind for Saturday... Doesn't sound very promising, even though it should be around 5kt - 10Kt. I bet more boats would participate if they didn't have to have crew member pay up to join SU. I for one am running into that problem and wonder how many others are. Side not Jawzon I pm'd you my number weeks ago and never heard back. I can't figure out why someone wouldn't want to contribute a mere 40 bucks, but then still want to reap the benefits of a tournament series provided by the hard work of all the paying members who donate their efforts to make it all happen. But that's just me. I can't wait...it's gonna be a blast! It will be good to see everyone again! Lets hope for good weather. btw...the club does not have a choice about the member thing - it's an insurance requirement. Give it a shot - the cookouts alone are a great return for your $40. TM - I'm in the same boat as your buddies. I've got 12 and 13 year old boys who are in every sport / club possible. Having set tournament dates actually helps me get out - I put them on the calendar in January and my wife and I plan around these dates. It pretty much turns out that these are the only days I get out salmon fishing with my boys every summer. I really don't expect to win - I just get out to have a bunch of fun with the other guys and hang with my boys. My partner / Michigander is probably busier than I - but he does the same strategy to get out. It's all good either way. If you don't fish the tournament and happen to be by the cleaning station at weigh in time stop by and say hi. I'll do my best to hook you up with whatever we are eating and introduce you to some of the guys. Rumor has it that we may have another walleye fish fry after one of these tournaments.......keep an eye on the tournament previews, stop by, and give it a shot, it's pretty good! Team Fish N Crew will be in attendance! Looking forward to seeing the normal turnout, but hoping to meet some new folks and get some more people interested in the tournaments! "the response was overwhelming for my add I had a lot of reponses and seem to have all I need right now"
You had to put an ADD Out? I heard you had an ADD in (4) major newspapers accross the country! Along with Facebook, Twitter and the like... Is that true? Was there a mutiny last year or what? LOL! Are guy's just diving-off over the side during tournaments... When I fished with you a few times, you didn't seem that tough on us! Chitown-Angler was started on February 10, 2003 and has received 207431365 page views in total since that date.